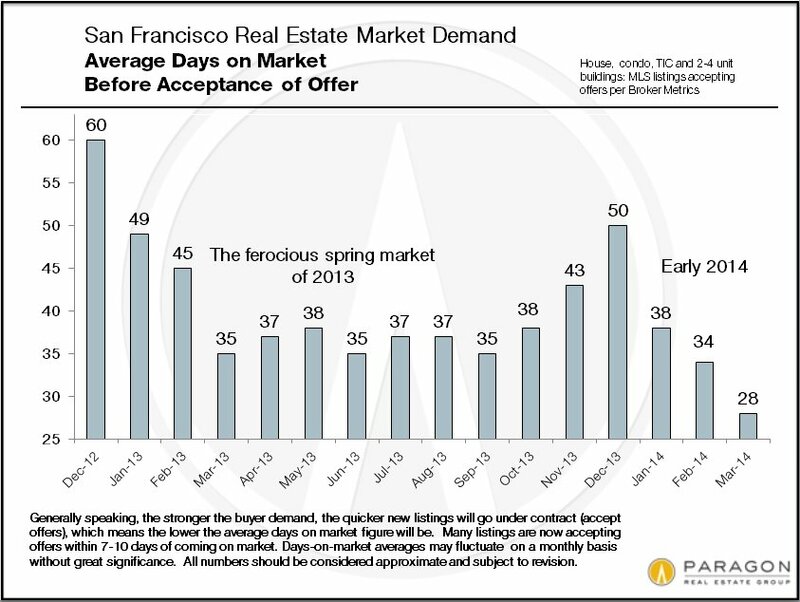 It’s not exaggerating to say that Yerba Buena has one of San Francisco’s most exciting, dynamic real estate markets. The district’s many rebirths have left it with housing options tailor-made for the city’s upwardly mobile – and those who’ve already reached the top. After decades spent as a mirror image to SoMa – transient-oriented housing mixed in among light industry and warehouses – and a long and tortuous lead-up to redevelopment, Yerba Buena began its latest (and ongoing) period of evolution in the 1980s. Early development again mirrored that of SoMa: one- and two-bedroom apartments, condominiums and lofts, the difference being that Yerba Buena’s builders favored large-scale projects, like the string of mid-rise residential buildings on the 700 and 800 blocks of Folsom, including 737 Folsom Street and Museum Parc (both built in 1988) and the Yerba Buena Lofts (built in 2001). Along with the SoMa Square apartments on Third Street, these early projects established Yerba Buena as a lively, high-density urban neighborhood offering spacious (if not enormous) living spaces and, in some cases, private outdoor living spaces in mid- to high-range buildings. All had one thing in common: proximity to the Moscone Center and Yerba Buena Gardens, landmarks that continue to act as the heart of the neighborhood. 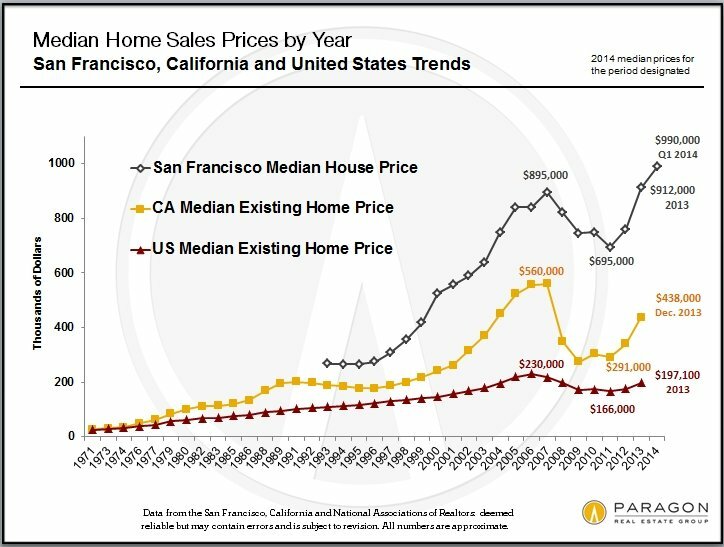 Yerba Buena’s next growth period came on the heels of the 1990s economic explosion, bringing with it demand for different – read “high-end” – living. The first decade of the 21st century was an evolutionary time for Yerba Buena, as high-rise developers began to target the neighborhood. This time they built on the blocks closest to San Francisco’s Financial District, mixing full-service luxury residential towers like Blu (631 Folsom Street), the Paramount (680 Mission) and the industry-leading Millennium Towers (301 Mission, named one of the top 10 residential buildings in the World by Worth Magazine) with ultra-chic combo hotels/fractional ownership concerns like the St. Regis (125 Third Street) and the Four Seasons (757 Market Street). These buildings include lavish penthouse units and amenities like 24-hour doormen and 24-hour concierge service, on-site fitness centers, conference rooms, swimming pools and rooftop decks. The last tower built during this wave was One Hawthorne, which began selling units in 2010. At the time it seemed that high-profile development in Yerba Buena – in all of San Francisco, in fact – was on indefinite hiatus due to the economic downturn. 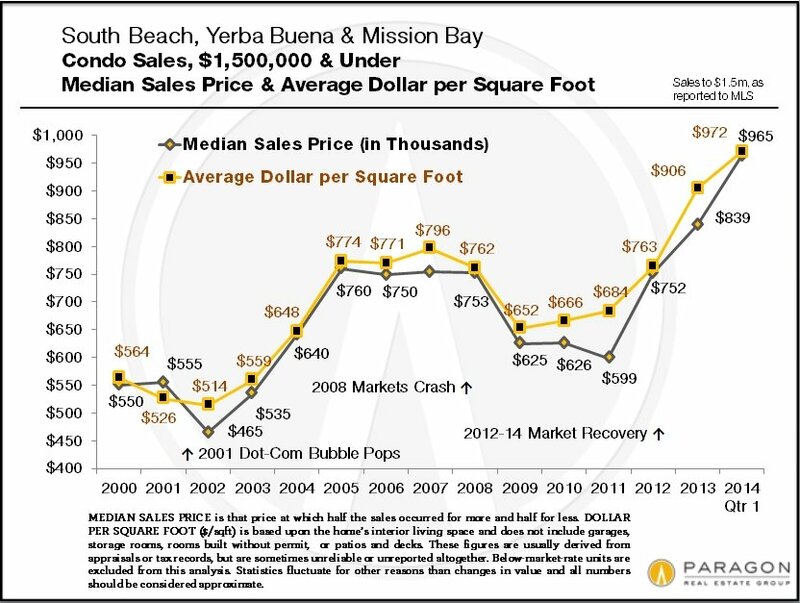 Instead, the economy roared back to life, and with it growth in Yerba Buena. There are presently a number of large-scale residential and commercial projects either proposed, pending or under construction in Yerba Buena, including a combination condo high rise/Mexican Heritage Museum at 706 Mission Street, a new 15-story Hampton hotel at 942 Mission and a significant expansion of the Moscone Center. Despite the upscale character of Yerba Buena’s latest wave of growth, the neighborhood is of late sharing its ultra-high-end crown to its neighbor to the east, South Beach. The latter features a collection of San Francisco’s most luxurious towers including the One Rincon Hill complex, the Metropolitan and the Infinity. Yerba Buena definitely has its share of significant skyscrapers but also a number of mid-level living options (a recent check of the MLS showed available Yerba Buena units ranging in asking price from $499,000 to $3.85 million), creating a neighborhood of varying scales, where residents do more than simply drive into a garage, take an elevator up 30 stories and stare out at the streets below. There are many ways to “do” Yerba Buena, with its central green space, its museums, its restaurants, shopping and lively workweek presence. It is a true city neighborhood. Taking a break from our usual real estate analytics (which can still be found using the links above), below is a half-serious, semi-whimsical look at how San Francisco is ranked by a number of objective and subjective criteria, according to a wide (and not necessarily reliable) variety of authorities. Typically, these rankings were made within the last 2 or 3 years. Many should be taken with a large grain of salt. 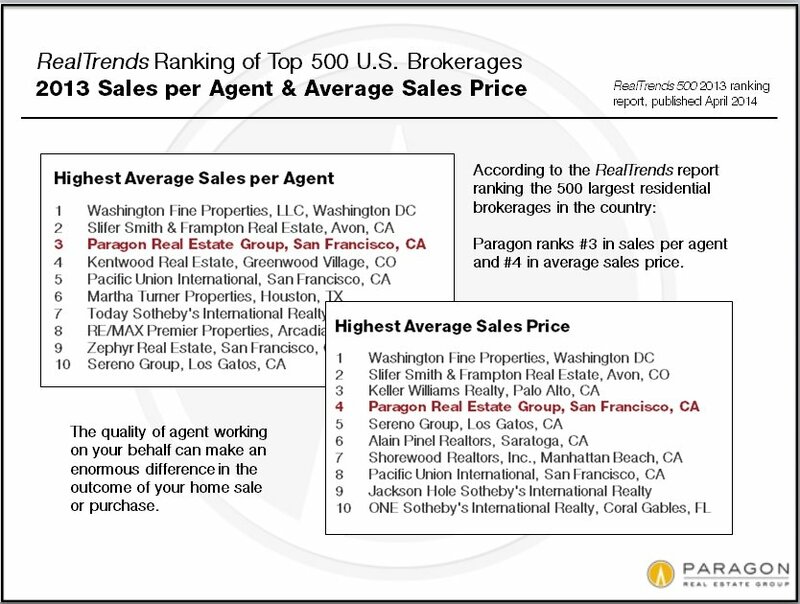 Generally speaking, rankings are against other major U.S. cities or greater metropolitan areas. 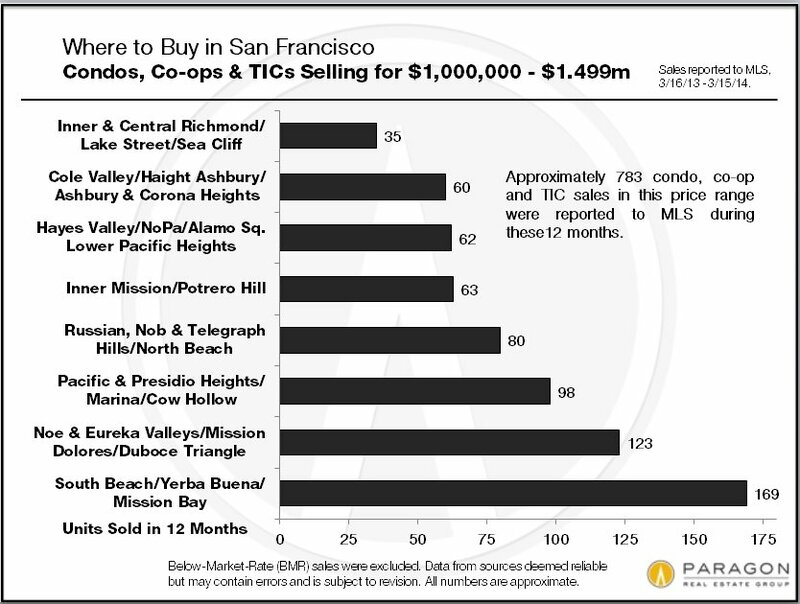 Note that both “San Francisco Metro Area” and “Bay Area” are often used to describe different groupings of counties. within 47 square miles on 43 – 50 “named” hills. 5th best city for dogs, per PawNation; est. 120,000 dogs live in SF, per City Govt. Misc. Fact – Estimated change in population since 2010: 32,000, per U.S. Census; new housing units added since 2010: approx. 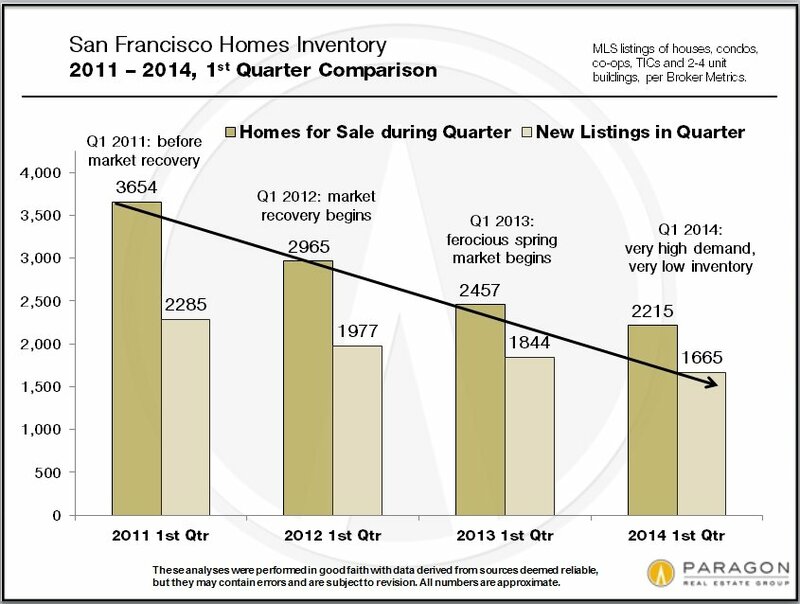 4200, per SF Planning Dept. Bay Area is 1st in hybrid and electric car sales: 9.4% of all sales are hybrid; .52% of sales are electric, per R.L. Polk & Co.
13th highest rate of consumer cell phone loss or theft (35%), per Symantec; more than 50% of SF robberies involve the theft of a mobile device, per SF Police Dept. 1st in the U.S. for real estate investment/development opportunity, per Urban Land Inst. Despite its reputation as the epicenter of the 1990s loft universe, the South of Market neighborhood offers an impressive variety of living options – with more to come. Construction is brisk at the neighborhood’s western and northern edges, adding a slew of impressive high-rise buildings to what so far has been a low- and mid-rise neighborhood, but that doesn’t mean SoMa’s fate is to be overrun by towers like neighboring Yerba Buena. Living in SoMa can mean almost anything. Back in its post-earthquake “South of the Slot” days, SoMa was defined by low-cost, simple housing like SROs and multi-unit Edwardian buildings, along with commercial structures — warehouses and small factories. The neighborhood was this way for decades, until long-delayed redevelopment began in the 1980s. With it came the familiar SoMa condo and loft buildings, entry-level alternatives that in spirit paid homage to the neighborhood’s democratic past. These one- and two-bedroom units remain a viable option for new homebuyers, though they now fetch anywhere from $550,000 to $1 million on the open market. A “SoMa loft” can mean a number of things. Some are converted original warehouses; others were built in the late 1990s or early 2000s. Some have an open living area and an upstairs sleeping loft, less than 1,000 total square feet of space and one bathroom; others can have as much as 5,000 square feet of interior space (like the converted warehouse at 721 Tehama Street, which sold in late February for $3.1 million), multiple bedrooms, three or more living levels, parking, outdoor space… “loft” has a flexible definition. Likewise can SoMa’s condos – added to the neighborhood during the 1990s and 2000s – be many things. Some are spartan; others are luxurious. Some share space on major streets with warehouses, lofts and factories; others nestle into SoMa’s quiet side streets. Some were designed by noted local architects like Stanley Saitowitz. Most have one, two or three bedrooms but some are studios. SoMa’s latest building spree will change the neighborhood, if only because the new buildings are so different than those already extant. As usual, SoMa continues to push the boundaries of San Francisco housing – if there’s a new trend, you can bet it’s happening in SoMa. Interested in micro-apartments? Builder Patrick Kennedy is at the forefront of the sub-400 square-foot apartment trend. He chose SoMa for two projects, 23 295 square-foot studios at 38 Harriet Street and 1321 Mission, which when complete will offer 120 (out of 160 total) micro-units. 80 of these small living spaces and all of 38 Harriet (not originally planned but how it turned out) will be set aside for student housing. What if your tastes tend more toward luxury high-rise leasing? For you, the “new” SoMa offers a number of under-construction options, most clustered along the reborn Mid-Market area. This deep roster includes the rebuilt Trinity Plaza complex (when completed, approximately 1,900 living units in four towers), NEMA (700 apartments at 1401 Market), 1400 Mission, which offers 190 below-market-rate units and 1415 Mission (121 studios, one- and two-bedroom apartments and street-level retail). These monster complexes are the highest-profile projects presently under construction in SoMa but they are not the neighborhood’s only new developments. Ava (55 Ninth Street) and Mosso (900 Folsom) are two other splashy new neighborhood arrivals. Nor are they its first luxury high-rises. That title was claimed by the SOMA Grand in 2008. All of this activity makes it clear that SoMa has left its “skid row” persona far in the rearview. It’s still a place where entry-level buyers and renters can find options, either with existing or new (all of the new developments include BMR units; two of them, 1400 Mission and the Rene Casenave Apartments, at 530 Folsom, are 100 percent BMR or supportive) housing, but its latest wave of construction makes very clear that SoMa is poised to join neighboring Yerba Buena as a preferred address for San Francisco movers and shakers as well. 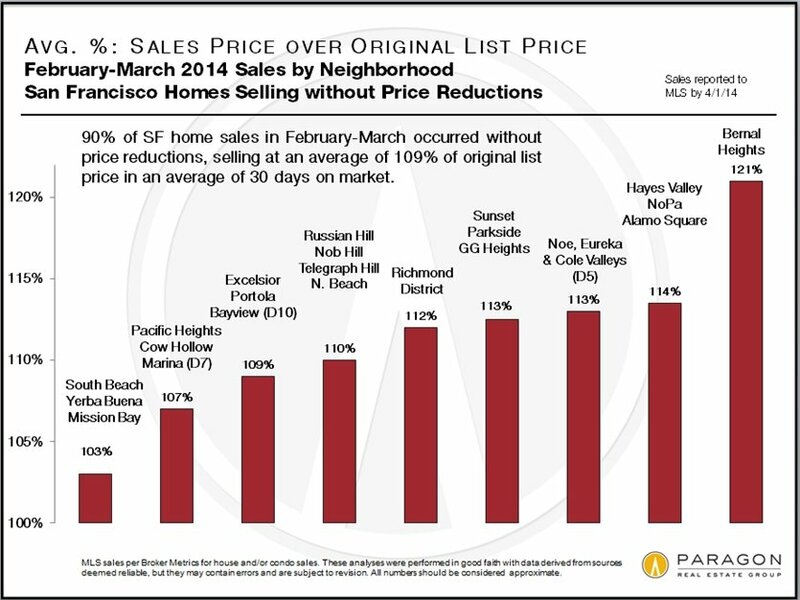 This chart below breaks down, by neighborhood, the average sales price to list price percentage for the 90% of homes selling without price reductions. 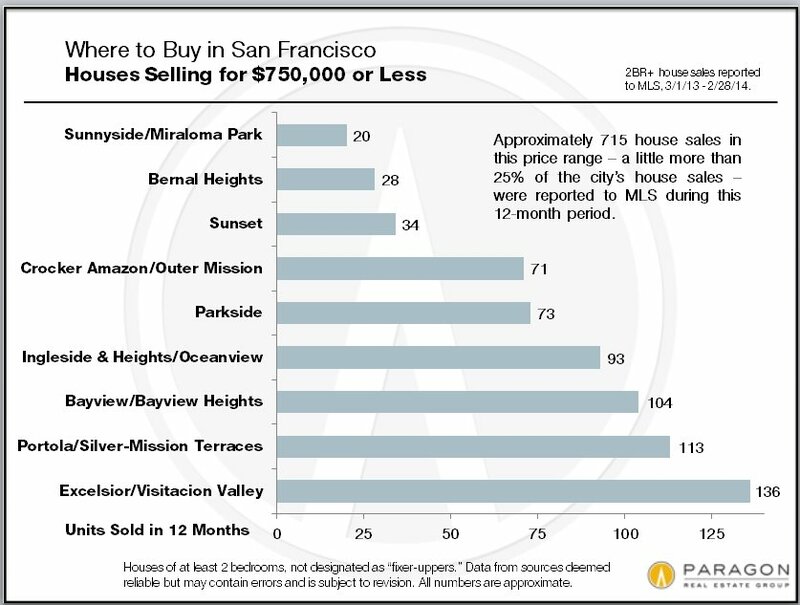 Of the areas assessed, Bernal Heights came out on top with sales prices averaging an incredible 21% over list prices over the past 2 months. Median Sales Price SpikesTypically, the first quarter of the year does not show a dramatic increase in median sales prices over the previous quarter – in fact, a decline in not unusual due to holiday market dynamics. 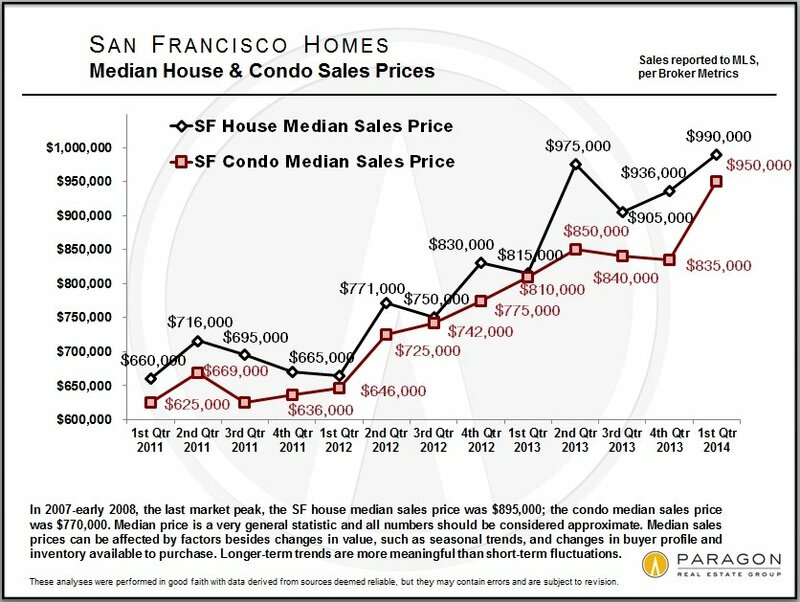 But the first quarter of 2014 saw large spikes in median prices for both houses and, especially, condos in San Francisco. 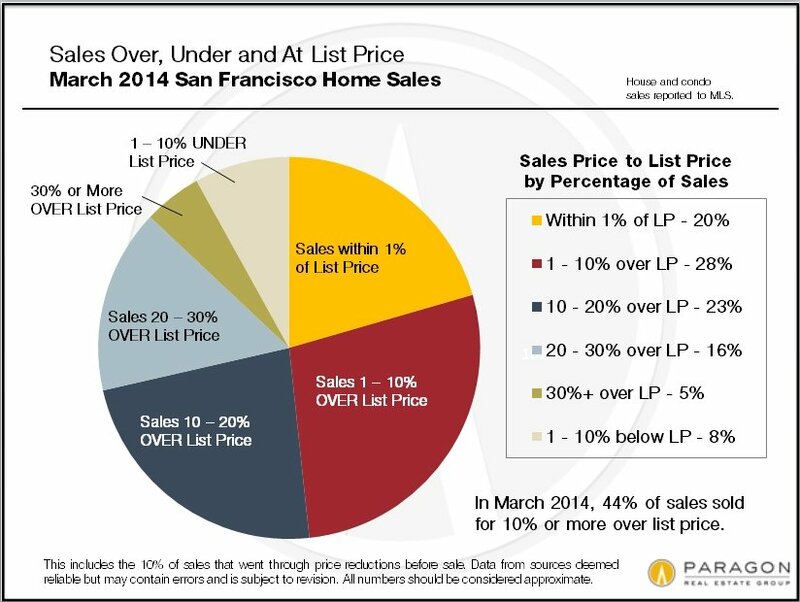 Listings Selling Faster than Ever San Francisco Neighborhood SnapshotsWe updated analyses for a number of city neighborhoods with enough sales for quarterly data to be meaningful. In every district we looked at, there were significant spikes in median sales prices and/or average dollar per square foot values in the quarter just ended. The latest change to hit SoMa came during the last decade. 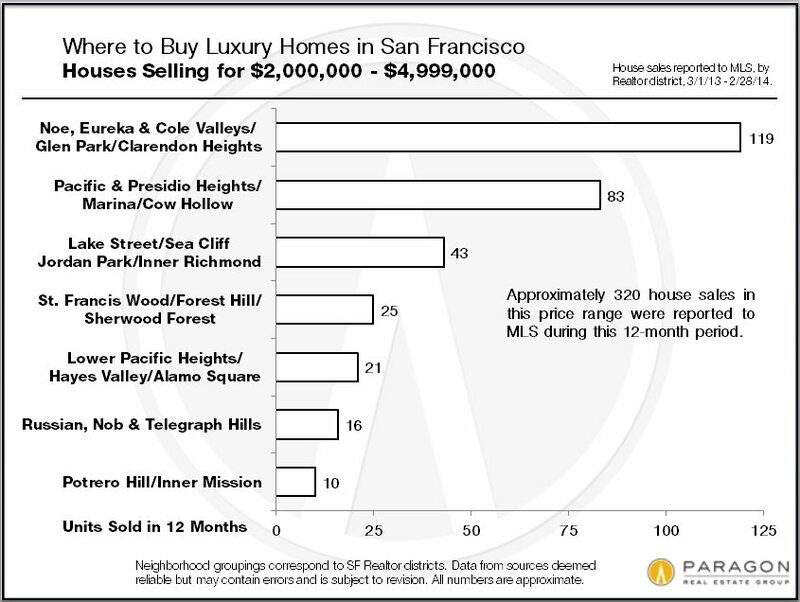 In 2010, the San Francisco Association of Realtors made official what had been obvious to savvy observers for years: that what we’d been calling SoMa had actually become three distinct neighborhoods, one wedged between downtown and Mission Bay called South Beach (Third Street to San Francisco Bay), one boasting a critical mass of luxury high-rise buildings called Yerba Buena (Fifth Street to Third) and funky, quirky SoMa (Fifth Street to the 101 Freeway). SoMa’s rich history is long and unique. It spent its earliest years as a residential neighborhood – one of the city’s finest – until the introduction of reliable streetcars pushed the district’s wealthy residents to the top of Nob Hill. In their place came working-class residents, dock and shipyard workers whose presence in SoMa dominated the next several decades. Whatever growth SoMa was undergoing 100 years ago was abruptly interrupted by the total devastation of the 1906 earthquake. The ‘quake and ensuing fire leveled the entire neighborhood. When it came time to rebuild, city leaders decided to emphasize light industry and simple housing. They widened SoMa’s main streets and lined them with multi-unit low-rise Edwardian buildings, which attracted the aforementioned transient workers. Many of these buildings remain and now stand cheek-to-jowl with converted warehouses, lofts from the 1990s and mid-rise condo buildings from the last decade. Modern SoMa is defined by its industrial past (from the exterior, the warehouses and apartment buildings on Howard, Folsom and Harrison Streets seem unchanged from the early 20th century) and by its forward-looking present (anything you can imagine fitting into a warehouse is inside these buildings: bars, restaurants, non-profit charities, art studios, tech start-ups). Its transition from “skid row” to the present was long and controversial, beginning with Benjamin Swig’s failed “San Francisco Prosperity Plan” in 1954. Swig’s hope was to make SoMa an extension of downtown, with high-rise office and residential buildings, but it was ultimately defeated by neighborhood resistance. Eventually, redevelopment came in a more organic, piecemeal fashion. Rather than start over, the neighborhood simply continued to evolve. As a result, despite its wide streets and commercial buildings, modern SOMA is a colorful functioning city neighborhood, with rec centers, parks, schools, grocery stores (Harvest Urban Market, at 191 8th Street, is a stellar new addition), bars and some of San Francisco’s most notable restaurants, along with decades-old mom and pop businesses and younger ones, like the combination Laundromat/café/performance space Brain Wash, which, after almost 30 years in business has become a decades-old mom and pop business. SoMa wears its past and present simultaneously. Whether it’s the constantly changing roster of night spots radiating out from the intersection of 11th Street and Folsom, the latter street’s scattered leather emporia (evidence of its 1960s and 70s run as the center of San Francisco’s nascent gay community) or in the gleaming steel barrels of the Cellar Maker Brewing on Howard Street, SoMa keeps parts of its past alive while simultaneously forging ahead. But what makes the neighborhood so special is that hidden just around the corner from its busy main thoroughfares are SoMa’s treasured alleyways, one-lane residential streets offering warm contrast to wide, noisy streets like Howard and Harrison. It’s here that you’ll find so many of the small, two- to 10-unit residential buildings that eventually became SoMa’s 1990s and after redevelopment. They’re pressed in among small warehouses (most of them converted into artists’ studios or live-work lofts but some still actively commercial) and Edwardian flats, creating small, quiet pockets of intimacy in the midst of arguably San Francisco’s most urban neighborhood. One of the best of these is the block of Harriet Street between Howard and Folsom. Here you’ll see contrasting architectural styles coming together not in chaos but in complement, all overlooking the playground and park of the Gene Friend Recreation Center. This street was described in Tom Wolfe’s 1968 book, “The Electric Kool-Aid Acid Test,” as a “poor, forgotten block.” It is forgotten no more. What comes next for SoMa? Part of the answer lies in the construction going on at its northwest corner. Here, emboldened by the success of Mission Street’s SOMA Grand building and the arrival of tech firms like Twitter, is a riot of new residential construction, four high-rise buildings hugging the Market Street border and boasting of amenities equal to those found in Yerba Buena’s standard-bearers. 37 stories at its tallest, just-opened NEMA adds 754 for lease residential units to SOMA, joining the massive Trinity Place complex one block away to emphatically declare that SoMa’s next step is directly up. NEMA and Trinity may be the future, but there will always be room in SoMa for the quirky, the small-scale and the past. That these can live side-by-side is what makes SoMa one of San Francisco’s most vibrant and interesting neighborhoods. Prior to 1998, there was no residential neighborhood in Mission Bay; no Victorian farmhouses, no worker cottages ordered out of a Sears catalog in 1910, no ticky-tacky little boxes constructed en masse by Henry Doelger before World War II, no apartments, no condominiums, no townhouses. There were rail yards, warehouses and parking lots. The Mission Bay we see now was invented by Board of Supervisors decree in 1998. It is unlike any other neighborhood in San Francisco, a fully-planned, 21st-century district featuring the latest in residential design and a growing population cutting edge commercial interests. In one important way, though, Mission Bay is the embodiment of a classic urban neighborhood: its residential makeup. Like Manhattan’s Upper West Side, Mission Bay has condos, townhouses and apartments and zero single-family homes. Way back in 1998 Mission Bay was divided into two Redevelopment areas: “Mission Bay North” and “Mission Bay South.” The project’s ultimate goal was to build 6,000 residential units in the new neighborhood. Half of those were completed between 1998 and 2010. The rest, as anyone who’s recently strolled down Fourth Street knows, are either under construction, just finished or waiting to break ground. Early building focused on Mission Bay North and consisted of several mid-rise condominium buildings, communities like Arterra, Park Terrace and The Edgewater on Berry Street and The Beacon and Signature on King Street, along with a few large apartment complexes (notably Avalon I and II and 355 Berry). It wasn’t until 2006 that 417-unit Radiance became the first Mission Bay residential complex built south of Mission Creek. In August, 2012, Madrone, located adjacent to Pier 52 on Terry Francois Boulevard, kicked off the second phase of building in Mission Bay. 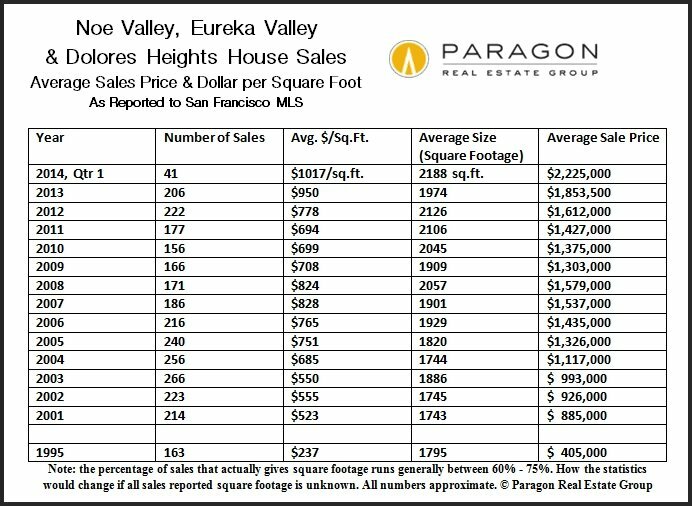 Madrone debuted to great fanfare, preselling 200 of its 329 units then selling 97 more during its first month of “official” sales. From Madrone development moved to a few blocks inland, to Fourth Street. Long-range plans here are to create a mixed-use urban core for Mission Bay, with retail, restaurants, commercial space and hundreds of apartment and condominium homes. On and around Fourth Street today you’ll find new or almost-complete buildings at 1155 Fourth (Venue), 1180 Fourth (Mercy Housing, with 175 Below Market Rate units), 1201 Fourth (Strata) and 185 Channel Street (Channel Mission Bay). When complete these five complexes will add approximately 1,200 residential units, the majority of them for lease, to the neighborhood. Channel Mission Bay, which opened for business in February, has already leased 35 percent of its 315 apartments. Mission Bay’s new residential communities are luxurious, with generous living spaces, of-the-moment style and amenities like on-site fitness and business centers, barbecue areas, movie theaters and concierge service. Venue, at 1155 Fourth, adds some additional, somewhat quirky perks like a waterfall, an on-site car wash and an on-site dog wash. The present phase of construction is hardly Mission Bay’s last gasp. With the 2008-2010 market downturn firmly in the rearview, ambitious development has roared back to life. Under construction at Fourth and Channel is Sol, a 21-story, 273-unit condominium building due for completion in early 2015. One block away at Third and Channel a proposal featuring a 250-room luxury hotel and 350 residential units is moving forward, and the impressively-named “Mission Rock Megaproject,” currently in its planning stages, aims to create a mini-neighborhood, with commercial and retail spaces, restaurants, hotels and residential buildings out of a series of parking lots located across McCovey Cove from AT & T Park. The project has already inked its first tenant, iconic San Francisco business Anchor Brewing. Other Mission Bay projects underway include a new Public Safety Building, a children’s park and a massive park at Mission Bay Boulevard South and San Francisco Bicycle Route 5. Though it may seem that an entire neighborhood has appeared and matured in only 15 years, Mission Bay’s future plans suggest that we haven’t seen anything yet.